"53rd Street" redirects here. For the subway station in Brooklyn, see 53rd Street (BMT Fourth Avenue Line). 53rd Street is a midtown cross street in the New York City borough of Manhattan, that runs adjacent to buildings such as the Citigroup building. It is 1.83 miles (2.94 km) long. The street runs westbound from Sutton Place across most of the island's width, ending at DeWitt Clinton Park at Eleventh Avenue. The Lexington Avenue – 53rd Street/ 51st Street station complex, one of the busiest in the New York City Subway system, is accessible from this street, and is served by 4, ​6, and <6> E and ​M trains. The Seventh Avenue station, serviced by the (B, ​D​, and E trains), is a similarly busy transfer station. The 53rd Street Tunnel carries the IND Queens Boulevard Line (E and ​M trains) of the New York City Subway under the East River between Manhattan and Queens. The Lipstick Building stands at Third Avenue. Citigroup Center is a 59-story skyscraper located at 601 Lexington Avenue, at the corner of 53rd Street. The Stork Club was one of the more famous nightclubs in New York City during the 1930s–1950s. It was located at 3 East 53rd Street, just off Fifth Avenue. The block between Fifth and Sixth Avenues also contains the former Donnell Library Center, the Museum of Modern Art, the American Folk Art Museum, and the "Black Rock" and "Brown Rock" (1330 Avenue of the Americas) buildings of CBS and (formerly) ABC, respectively. A skyscraper was topped out in 2018, at 53 West 53rd Street. The block between Sixth and Seventh Avenues has the Calyon Building and the hotels Hilton New York and Sheraton New York, separated by a subway powerhouse. At the middle of this block, there is a crosswalk as part of a north-south pedestrian avenue named Sixth and a Half Avenue. A section of 53rd at Eighth Avenue was named Jerry Orbach Way in 2007 in honor of the actor, who had lived there for 25 years. The Ed Sullivan Theater is at Broadway, across the street from the back door of the Roseland Ballroom and next to another subway powerhouse. The theater is the location for the Late Show with Stephen Colbert. Colbert's predecessor, David Letterman, sometimes used the street for segments of the show. The Wendy Williams Show was taped at 433 West 53rd. A building at 811 Tenth Avenue, between 53rd & 54th Streets, houses the largest New York City exchange of AT&T Long Lines. It extends about halfway to Eleventh Avenue and doesn't have windows; there are only two small rectangular openings located just above the two flagpoles on either side of the front door, giving access to the flags. The street ends at DeWitt Clinton Park at Eleventh Avenue. ^ McGeehan, Patrick. "In This Corner, Finally, It’s Jerry Orbach Way", The New York Times, September 17, 2007. Accessed August 11, 2009. ^ "David Letterman - Bill Murray Kicks Field Goals". CBS on YouTube. Retrieved 5 February 2012. 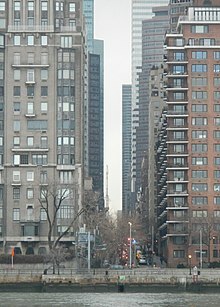 Wikimedia Commons has media related to 53rd Street (Manhattan). This page was last edited on 19 December 2018, at 16:38 (UTC).